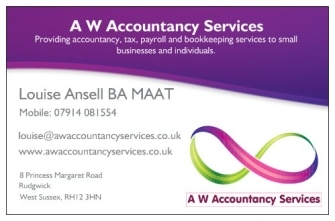 A W Accountancy Services is run by Louise Ansell. Louise has extensive experience in taxation and accountancy. Louise is an AAT qualified Accounts Technician and previously worked for another local firm of accountants for 13 years before deciding to branch out alone and has many years experience looking after the needs of a wide variety of small business and personal tax clients. We provide a friendly and responsive service on all aspects of Accountancy and Taxation, including Company Accounts, Self Assessment Tax Returns, VAT Returns, Bookkeeping, Payroll, Automatic Enrolment Pensions and Company Formations. Please contact us for a free initial consultation. During your consultation, we will discuss your needs and provide an accountancy solution that is tailored to you.